Great question(s)! I myself often wonder whatever happened to the evenin’ TV. Youre just sitting there watching TV and next thing you know evening rolls around and boom it just shuts off and how come I cant get no milkman NOR paperboy (for NES) round here? Anyway, this evenin’ on TV, (y)our Ottawa Senators face off against everyone else’s Winnipeg Jets in an event that can only be described as “a hockey game.” Who knows in this work a day world what will happen? No really, Rachmaninoff was right, whatever happened to predictability? Have you seen those poor dudes stuck doing the Ottawa Citizen’s prediction panel? That’s been a tough gig so far. I can’t tell how this one will go, even losses are all over the place right now. In my last preview, we discussed the veritable Wheel-O-Defeat Scenarios that the Sens seem to spin before most games. As it turned out they landed on “Coloradoesque blow out” last time out. What kind will it be tonight? The Battle of the Kool Mo Dee Concert: Craig Anderson gets the start in goal after a brutal outing by Alex Auld and some brutal outings by Craig Anderson. Oh sure, Craig hasn’t gotten much help as this year’s defense corps(e) has been pretty bad but uhh on the other hand, last year’s defensive corps was ALSO quite bad. Will Andy make tonight the night that he finally steps up and steals the Sens a game – yup that’s where we’re at, I’m talking about “stealing” a home game against the Winnipeg Jets – If he does, it could serve as a big boost for the team going into Saturday’s tilt against the Columbia Skijackets. Human man / goaltending enthusiast Ondrej Pavlevecstarts for Tha ‘Peg. The Battle of the Special Little Guys: Atlantipeg offensive d man Tobias Enstrom was first put on my radar screen back in the hott diggity day (cool expression, right kids?) by WTYKY’s own Varada (we know each other in real life sometimes). I was in the midst of a pessimism spiral about recent first round draft pick Erik Karlsson’s chances of making the NHL. “How is this delightliful little circus elf going to crack the lineup?” I stupided, “Show me another guy this small on D besides maybe Brian Rafalski who’s currently cutting it in the league.” With his swift eyebrows of wisdom he pointed me toward the sunny shores of Enstromia*. “Well, this kid’s about Karlsson’s size, plays a similar game and he’s getting’ r’ done. GETTIN’ ‘R RIGHT FRIGG’N TIGHT! Frigg’n RIGHT bud!” Those were his exact words. Anyway, I kept an eye on the kid, even picked him up for my (probably terrible) fahn-tasy team. As I watched his development as an NHL player a sense of Kalmsson began to wash over me…in an awesome wave. L’il Toby picked up a very impressive 51 points in 72 games last season and 50 in 82 the year before. Not bad for an 8th round pick. Dont stop believin’ Bryce Aneloski! He also skates to a Karlsson-like minus rating every year. For me, every meeting betwixt these two wood nymphs is a Battle of the Special Little Guys. Enstrom has 2 points in his last 3 games but also had a pretty brutal own-goal against the maple loafs last night. 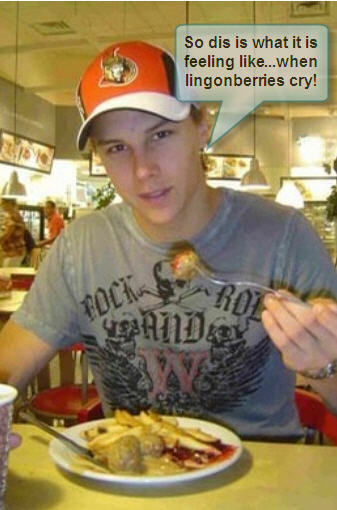 Karlsson, on the other hand, is first-bite-of-drunk-pizza-hot with 7 points in his last 5 and a team leading 8 pts overall which is awesome aside from the whole losing all but one game this year thing…so he’s also got that working against him tonight. Which Little Guy will be most special!? I would love, love, love to see the Sens get on the score sheet first tonight. MAYBE EVEN GO UP BY TWO GOALS! The Sens aren’t going to go 1-81 this season *tugs collar* and those wins have to come from somewhere *awkwardly puts hand on your hand in an attempt to reassure you* …somewhere like this game. I think a loss, especially a bad one, could be a strong indication of how bad a season this could end up being. February of last season bad. The boys have nearly everything they can have going for them heading into this game. Put a W up for people who are paying money to attend tonight, oh and also for your own pride. Rally boys! Also, something, something Sergei Gonchar is back…im going to just kind of leave that one be. Finally, really hoping for a goal from Zibanejad tonight. That would be great to see for him! He should be more comfortable back at centre tonight. On a selfish note: C’mon and score little buddy, I’m starting to get a little rookie envy from all the other teams. If we lose tonight we have an identity, and it’s the Columbus Blue Jackets. Oh, and Enstrom’s been gold for me in hockey pools dating back to 1987.